Today, my daughter Anastasia wrote a paragraph of her thoughts on Deaf and Hard of Hearing children being language-ready for kindergarten, in favor of Texas Senate Bill 354 of the 85th Legislative Session, also known as the Lead-K Bill. The caption for this bill is "Relating to language acquisition for children less than eight years of age who are deaf or hard of hearing." This bill was filed by Senator Kirk Watson who represents most of Travis County (where Austin is) and all of neighboring Bastrop County. I'd told her that this particular bill, that we had a conversation about earlier this month, was going to have a hearing happening on it this coming Tuesday morning, May 2nd. She wanted to go but I told her she's going to school and she could write something that I could turn in for her. Here it is, all in her own words! Deaf and hard of hearing children shouldn’t be denied confirmation of a proper language. If you don’t agree, look at this as if there were no spoken English test. Your hearing child would have to know ASL to have a ready language for kindergarten. Your child would have to know a language they wouldn’t normally use. That is how it is for deaf and hard of hearing kids. Parents' note: Hearing children (under 18 years old) of Deaf adults are known in the Deaf community as KODAs (Kid of Deaf Adults). My muses for this are from two key sources: my DeafBlind, ProTactile-using (and PT inspiring) friends Hayley Broadway and Sarah Morrison, and my 6+ years of wanting accessible, yet natural feeling, interaction and information for my DeafBlind 6 year-old son Orion. These thoughts were jogged while preparing for Hayley and Sarah’s much-anticipated ProTactile presentation at the 2017 Texas DeafBlind Symposium on 3/4/2017. 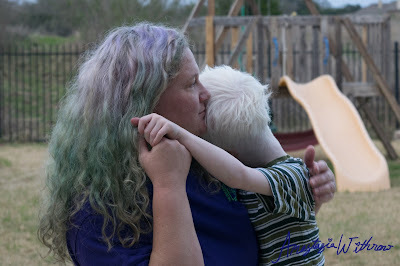 Image description: A woman with faint colors of lilac and teal in her hair, on the left, embraces her white haired DeafBlind 6 year old son on the right. He is resting his head on her left shoulder, facing away from the camera, his hand is over mom's right index finger. Mom's left hand is holding his upper back and she is looking at horizon somewhere off the right side of the photo. We’ve known since before Orion was born that touch would be a key part of his life. What we know today was refined, elaborated, practiced and it will continue to develop over time as we learn from our mistakes, discoveries, and Orion’s responses. Communication can happen at any level ranging from the level of involuntary communication, and then voluntary communication including the simplest basic refusal (such as refusing food or spitting it out) all the way through to abstract languages such as American Sign Language, English, Tagalog, etc. My thoughts on touch grows upon the basis that it is versatile through any level of communication. Disclaimer: I’m a Deaf mom who loves any topic regarding congenitally DeafBlind individuals provided by presenters, DeafBlind-related specialists, and therapists in person or via articles and videos. For the sake of categorizing types of touch in my thoughts here, there are two— direct contact and indirect contact. Constantly in skin to skin contact: any part of your body to any part of his body, in any situation (floor, bed, highchair, bathtub). Touch is not only done by your fingers but any part of the great skin organ we have. 1) Touch his knee, elbow or upper arm. 2b) From his elbow, glide your fingers up to his hand. 3) Sign “Hi”. If he still holds on to feel what you’re doing, quickly add Orion’s name sign to say “Hi, Orion”, and then “Me” and your name sign. Note: if Orion withdraws contact during any step, that is OK. He knows you/someone is there. Do not go directly to his face, chest or palm of his hands without greeting/touching him in the first place. Any new comments or actions, you touch Orion the same way as you greet him (step #1 and #2 above). Staying in contact is providing constant feedback to Orion on your actions. Another benefit is that it’s less startling to the Deafblind child is tapping or prompting him with the same hand or body part that’s already in contact. Moving yourself or an object while in contact informs him where you/it ends up. Tip: If he pushes you away, let him. Follow/accept where he puts your hand and stay there for a while and then go back and touch him. If he pushes you away again, accept and stay there. (Object permanence.) Orion does check and see if you’re still there even when he requires his own space. Other ways to indirectly inform him that you’re there if not directly touching him is through your vibrations, movement, scent and movement of air. Some examples are sitting on the bench with him, bed, stroller, wood floor, etc. There’s no need to tiptoe around because its beneficial to be noisy or create vibrations because your DeafBlind child will know something’s up. When Orion was a baby, he’d lounge on a nice setup on the wood floor, you can feel when people walk through the room and approach you. We would touch the frame of his stroller or the edge of the playpen before touching Orion’s legs and arms because this alerts him that someone is near and perhaps approaching him. Orion loves our bed maybe a bit too much. When I get up and go to the other side of the bed, instead of just walking around and re-touching the bed, I suggest you get up, keep your hands on the mattress- drum it, push it with your fingers, anything, including bumping your leg against the bed frame wherever you are— be a klutz— until you go to the other side of the bed, Orion will have observed exactly where you were, went and are now and will not be startled when you are in contact with him again. Touch is not just for communication, it overlaps with information/observation uses, too. If nobody touched Orion, or any other DeafBlind child, while doing their own errands or activities, Orion/they may assume people just sit or lay around all day so he will do just that. He will have received misleading information even with the absence of touch! Another touch information example is bringing Orion to the refrigerator to get the milk jug out, taking the top off, pouring it in his bottle, putting the bottle top back on, putting the milk jug cap back on and into the fridge and giving him the bottle to enjoy. This was not easy to do, and I recommend two people working together for this one but when this is done, Orion gets input to build up concepts about the things, people and activities in his environment. We encourage nurses and doctors to let Orion feel the medical tools first before using them on him. Tools, including utensils, bottles are concrete, self-explanatory objects that Orion knows about. We can use these objects as object symbols when we’re not currently in the situation, such as letting him know we’re going to the doctor by showing him a spare stethoscope. If habit is a comfortable bed that’s hard to get out of, then touch communication is a bed I wouldn’t even try to get out of. When this is an effort that you think of to do every day, every time, it has a chance to become a habit and then a lifestyle. It would be even better as a family, team or community lifestyle. Orion is a naturally happy boy, he is even more content and quick to play when we’re in touch with him. This is something anybody can do, family members, teachers, bus drivers, doctors and friends can share of themselves through touch. Anyone. Abstract language is not required for touch communication and information. DeafBlind strategies and ProTactile do connect with each other like the two circles in a Venn diagram. What I share here is in that overlap. Your emotions definitely show though touch. Consider the calmness of contentment, tension of frustration/anger and the animation of excitement. DeafBlind autonomy for me also includes respecting the individual’s hands, no matter their age. We’ve almost always avoided doing hand OVER hand with Orion… we entice, tempt him find ways for curiosity to take over and he put his hands on ours rather than forcing the issue. When we did try hand-over-hand it did not work out anyway, he would successfully pull his hands away. He will not have any of it- of someone controlling his hands. Exceptions are asking for permission from a DeafBlind individual who understands the request and grants permission. Orion's intervener came over yesterday (Sunday) to play with him. It was a very welcome change for me as we've been short on interveners lately. There's only so much I can think of to do and actually do in a day to keep Orion's days rich and nurturing during school breaks, weekends especially long weekends with no school on Friday and Monday, when I'm the only parent in the house (hubby is scouting the Deaflympics venues in Samsun, Turkey at this time*) so it helps to have other minds and hands to help out. The photo below was of what I came home to after a quick Starbucks/HEB food run: a happy Orion hugging and moving the SubPac around with his hands and feet. Cyndi Lauper was playing via YouTube on his intervener's iPhone which was connected to the SubPac. Both Orion and his intervener were smiling and having a great time! Accessibility was helped very much due to labeling the drawer that had Orion's SubPac in it. (Photo shown below.) And serves a great reminder that the SubPac is here and ready to play. We have not worked this activity into a schedule yet as it's hard to keep the family on a rigid daily schedule, especially on no-school days. For now it's an item to check-off a list of activities Orion enjoys. I think Orion really enjoys the SubPac... and according to his intervener, Cyndi Lauper's song, "Girls Just Want to Have Fun," was playing during this photo. 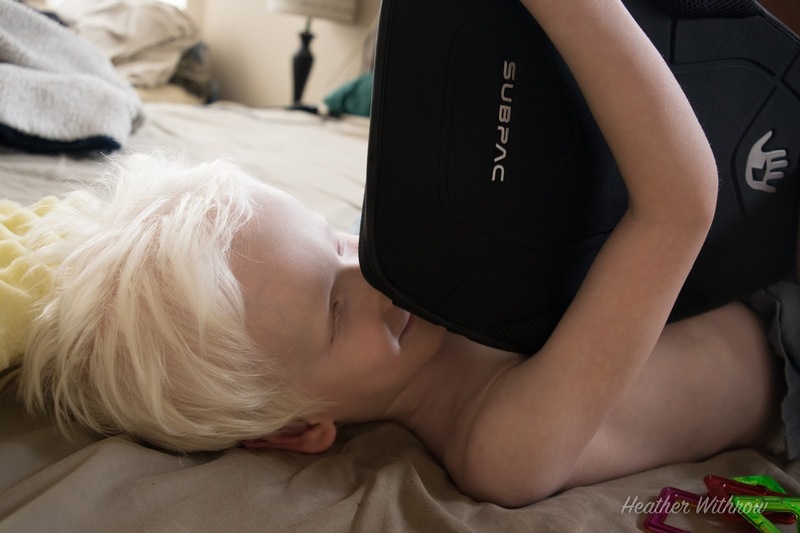 Description: A smiling, DeafBlind white-haired 6 year old boy is laying on a bed, holding the SubPac perpendicular to his chest. The SubPac is partially hiding Orion's wide smile. Description: light green masking tape pieces are placed on the bottom drawer of an oak dresser, the first tape reads, "ORION'S DRAWER," and the second tape below it reads, "SUBPAC". * I'm happy Thomas is able to go to Turkey, though, because unfortunately chatter on social media has been giving this richly artistic and beautiful country with many centuries of history a bad rap. Thomas reports that Samsun, in north Turkey on the shores of the Black Sea, looks good and clean, is safe at the level of any other ordinary place in the USA and the world, and the people are friendly! He's excited and ready for the Deaflympics there this summer!